On lightly floured surface, roll dough to 1/4-inch thickness. Cut with 2 1/2-inch gingerbread man cookie cutter. On ungreased cookie sheets, place cutouts 2 inches apart. Spoon frosting into decorating bag fitted with round tip. Pipe frosting on cookies. Decorate with cinnamon decors. You can bake cookies and store them tightly covered in the freezer for up to two months. Is there anything that smells more like Christmas than gingerbread cookies baking in the oven? The aroma of cinnamon, ginger and other classic spices have filled up kitchens for centuries and taken all kinds of gingerbread shapes (gingerbread houses, gingerbread boys and girls, gingerbread bars—you name it!). So if you’re looking to follow centuries of holiday tradition, get your ingredients ready. Did we mention this particular recipe only calls for five ingredients? 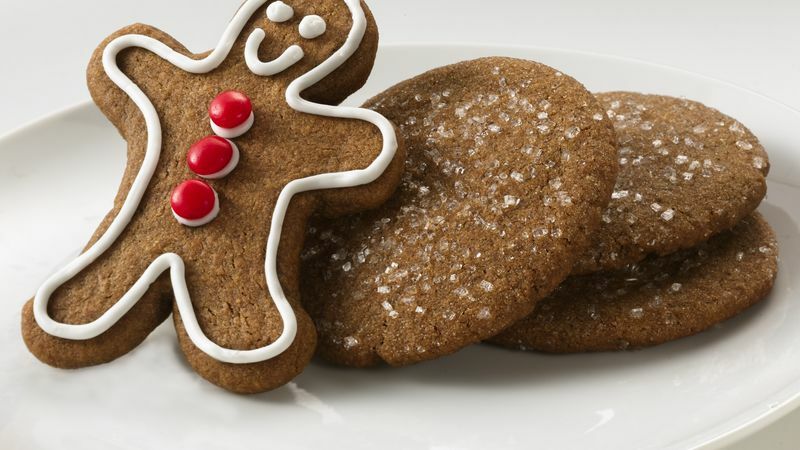 Making deliciously chewy gingerbread cookies couldn’t be easier. Baking up some gingerbread men is great, but if your taste buds are impatient these are just as tasty in classic cookie form. And if you really can’t wait for your kitchen to smell like Christmas, you can bake them up now and wrap them up in your freezer for up to two months. Our Betty Crocker Kitchens experts share their top 10 tips for baking, freezing and decorating, so you can learn how to bake the perfect cookies like a pro.